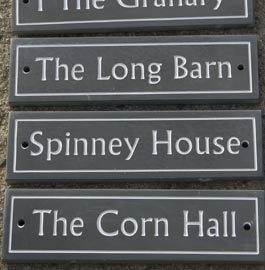 The slate home signs and slate business signage made with natural slate with smooth, but not highly polished surface. This shows the markings and grain of this lovely material - each piece is different. 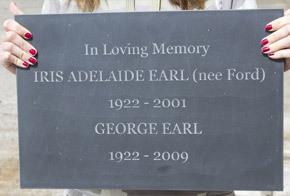 We cut our slate onsite to any size you require. 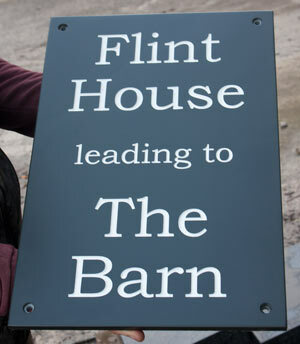 We can also polish both sides for double sided slate signs. Our local blacksmith has made some special wrought iron hangers for the doubled sided slate signs. See Fittings We also make wooden posts with hanging arms as well as Wrought Iron Brackets Click Here. As for letter colour - we have far more choices along with the standard white. Black is popular along Farrow & Ball colour Lichen which is light green, or F&B Purbeck Stone which is a very light grey. Click here to see colours. Memorial gold or silver also available @ £10. Memorial gold looks very similar to gold leaf. 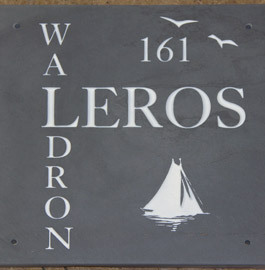 For our made to measure home signs and slate address signs we use slate which is 12mm or 20mm thick. This can be down cut to any size. 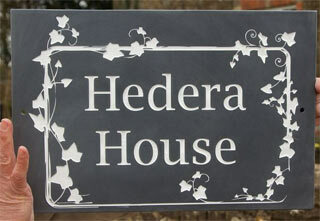 For thicker slate signs (30 - 50mm) or larger signs up to 600mm x 2100mm please CLICK HERE. 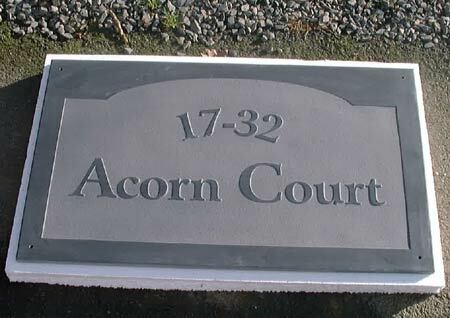 This slate sign has a drop shadow effect. Again we must use a bold font. Lettering is engraved. Extra £15 for second paint colour. 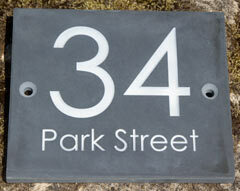 Smaller letters, down to 15mm are possible, if left unpainted - cost 55p per letter. 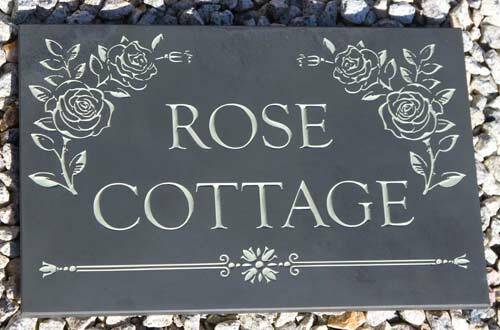 We can add a line border with indented or square corners to your slate sign at a cost of £6.95 for most home signs. 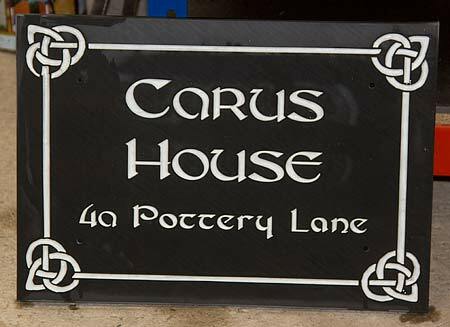 Another interesting technique is the border in relief where the slate around the outside of the sign is blasted away leaving the required shape in the middle. 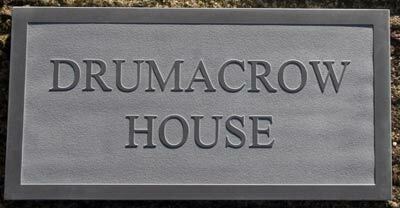 When the letters are raised and unpainted there is no extra cost for surrounding or line borders. 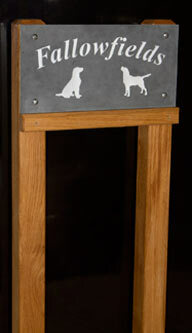 We can use decorative borders for raised and unpainted. 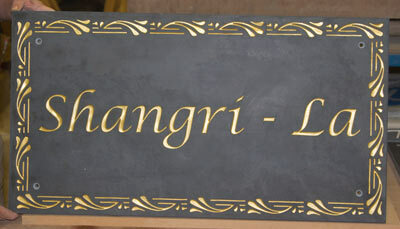 Borders are more expensive for larger slate signs due to the time it takes to sandblast the stone - see below. It is difficult to drill holes into slate as it requires plenty of water to keep the slate cool. We can drill the holes for you @ £1.10 per standard hole. £1.95 per countersunk hole. 2 holes are ideal on the 100mm high slate and 4 holes on larger slates. was made to fit on a gate. 2 holes drilled. Upper/ lower case - font Bitstream Argus BT Bold , Letters raised & unpainted with surrounding raised border. Made in the UK. 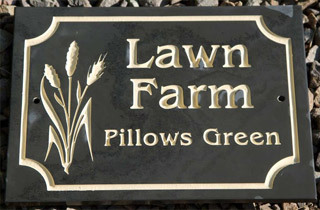 Our team at The Sign Maker looks forward to helping you with your slate sign.